I’m not sure if I have been in a book slump or of my mind hasn’t been able to focus due to all the things going on at work at the beginning of the year, or if it was inability to find a book that could hold my attention. It was probably a hybrid of the two, since I’m still in a very picky mood about books, but count on Seanan McGuire, a true and tried favorite, to get me out of my slump. I’m rather late getting to this series of novellas about children/teenagers at a boarding school for children that have returned from magical adventures. It is an interesting premise – there are so many stories about magical journeys and doorways, but few deal with the aftermath. Is it really reasonable to believe that after ruling as kings and queens for years, the children of Narnia would be able to return to their normal life? It’s easy to end the novel saying they had happy memories and dreams, but wouldn’t it chafe to be treated as a child after being a ruler or a hero? 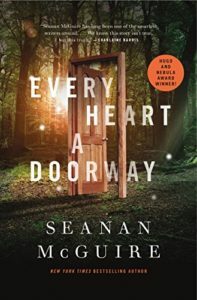 Seanan McGuire explores this premise, and she shows the children that didn’t want to return, can’t adjust and have changed in way their families can’t deal with. For some, when they returned, they were placed back in the bodies they were in prior to finding their passageway, seemingly never being gone. For others, time passed (sometimes the same, sometimes differently), leaving them to return to families that have changed, who think their daughters (and the rare son) were kidnapped. Nancy is the latest arrival at the boarding school, a teen girl desperately wanting to return to her true home, the place where she finally felt herself. All the students at the boarding home would prefer to return to their true homes, and Eleanor created the school for people like her – ones that had magical, dangerous adventures in alternate worlds (they are nicely categorized like directions with descriptions such as nonsense and logic, wicked and virtue, with multiple smaller offshoot directions). They can’t fit back in with their former lives and those expectations, so Eleanor can at least help them adjust. Of course, when murders start shortly after Nancy’s arrival, there is a fear that their sanctuary might be shut down, and Nancy becomes friends with a few of the other students that are viewed in a peculiar manner due to the types of worlds they were in as they try to solve the case. It was an intriguing beginning to a series, and while I want to read more about the students going to the school in the next parts, I also want to visit the many worlds these children once traveled in. The divided between the students and how they viewed each other based on the types of worlds they visited was rather interesting as well as how McGuire talked about gender in the novella. Share the post "“I’ve Been Expelled From Heaven, I Think I was In Heaven”"